It’s the last day of the year, and you haven’t heard from me since Halloween. I’ve been jotting and deleting various deep and shallow thoughts since then, but before the New Year begins, I want to wish you good health and good cheer in 2015 and beyond. And I hope your Christmas was full of blessings, even some joys, wherever you are on your journey. I’ve been under the weather again for more than a month. Always wondered where that phrase came from, so Googled and learned it’s probably of nautical origin — stormy weather sends sick seamen and passengers below decks where the ship is more stable. (You’re welcome.) What first seemed like a mild cold morphed into misery, involving nose, throat, chest and sinuses. You know the feeling. Low on the scale of serious illness, but disabling for a time. I was beginning to recover a week before Christmas when I accepted an offer I couldn’t refuse: — as a long-time modest donor to Public Television, I was invited to a preview of “Downton Abbey’s” fifth season on December 18th in Washington, DC. My lips are sealed. You’ll have to wait till January 4th along with the rest of the commoners to find out what happens upstairs and downstairs in the Crawley household. I’ll be watching it again next Sunday. It was worth my relapse. I think. The afternoon of December 18th was bitter cold and windy, and I bundled up warmly head to foot and drove to Baltimore, planning to park at Penn Station where I’d take Amtrak to DC. No room at the parking garage, so made a right at the corner, drove into an unattended lot with a boarded up booth at the entrance, finally found a payment machine which only worked when I smacked the screen in frustration, rather than touching as instructed. Bracing against the freezing gusts, I walked two longish blocks to the station, grousing about our overly mechanized, dehumanized world. Don’t think I’m fooled by the perky voice of Amtrak’s robotic Julie! Since I’d missed some of the Dowager Countess’s wry remarks last season (Dame Maggie Smith at her inimitable best) I’d requested an assisted hearing device, but none were left when I arrived at the hotel, so I was escorted to a center front section reserved for generous donors. A small ensemble of strings, winds and piano which entertained before the showing, and tea, coffee and pastries were graciously served. I was enthralled with all the heart, humor and drama — not to mention the gorgeous costumes, settings and wonderful acting. Came home in a glow, partly the start of a slight temperature. I’m grateful to be as well and active as I am now — thankful to be here at all after breast cancer 35 years ago and a poor prognosis. In fact, on my 83rd birthday on December 3rd, I cheerfully kept a mammography appointment — still no problems, thank God. That evening I celebrated with Angel at home — she gobbled her dietetic kibble and mush, and I relished two lobster tails, baked potato, salad and Champagne. A few days before, my family had treated me to a festive dinner at Liberatore’s, a favorite restaurant. My toddler grandson, itchy in a highchair, strolled around a bit, but when he wandered into the bar got scooped up to help me blow out the candle on a gooey slice of chocolate cake. Helped eat some, too. Christmas morning I went to Mass and drove for a visit to my son’s house in Baltimore, still sick, but wanting to give them my gifts. I had such a good time in stores picking out toys, hugging teddy bears. 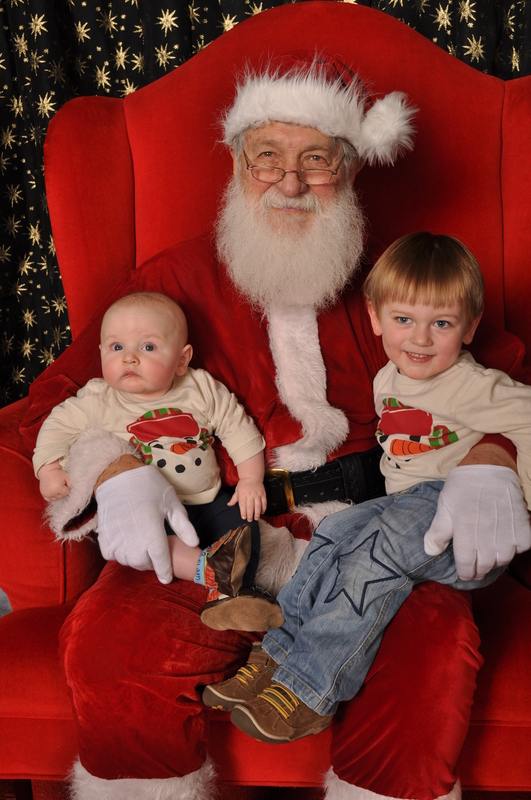 It wouldn’t be Christmas without seeing my grandsons — the adorable children sitting on Santa’s lap above. As Angel and I came up the front steps, the two-year-old parted the door curtain and shouted “Hi Gramma!” Then the baby greeted me with a wide, toothless smile. I tried to keep a germ-free distance, missing the hugging and kissing, drank some wine (for medicinal purposes), ate some cheese and crackers, and drove home happy. The next Saturday I had two tickets for a musical of Capote’s “A Christmas Memory,” at the Irish Repertory Theatre in New York City, was going to meet my friend Therese for lunch before the matinee. And I’d booked a seat to and from Manhattan with Megabus, a reasonably priced three hour ride each way the same day. But I called Therese the day before saying I was ill, not up to a long outing, suggesting she go with someone else. She said she’d rather go another time with me, so I donated the tickets to volunteer ushers. The same afternoon my sister-in-law and her husband, Peg and Ed, were hosting a family holiday party at their home in Delaware — I’d bought the tickets earlier than her invitation — and she thought I’d be able to come now with my son, but I too sick. A good time was had by all, I heard. Except, on his arrival, my two-year-old grandson, greeted at the door by a big barking dog, confided to his father: “I wait out here.” Carried inside, he lay on the floor for a while, then got up and mixed and mingled. His parents have told me they think he takes after me — he’s talkative, and you don’t have to guess how he’s feeling or what he’s thinking. An open book. Not sure they mean the likeness as a compliment, but I’m taking it as one. These days are priceless, and I’m so grateful for the many gifts God has given me. And since the recent death of my cousin Mary and the serious illness of her brother, my cousin Paul, I’ve been reminded again that these are only on loan. But I’m hoping to live long enough to see my grandsons grow more, and that they’ll remember me. They would have loved their Grandpa Gallagher, but I believe my husband is beaming on them from Heaven. Meanwhile, for the New Year, I’m registering for yoga and digital camera classes. And I’m planning to do more volunteer work. I enjoyed presenting storytimes a while back at daycare centers, except for the early schedules — have never been a morning person. Will probably renew my membership in the Harford Artists Association, though I haven’t sold any photographs in three years. Three are now displayed in a rotating exhibit at the Katzen Eye Group — and it’s fun to see them hanging there. My new ophthalmologist, Dr. Joe, happens to be with Katzen, and confirmed the glaucoma in my left eye has worsened since cataract and glaucoma surgery two years ago at the Wilmer Institute in Baltimore. (See “Fasten Your Seat Belts.”) I sometimes have difficulty focusing when reading, and the disparate sight in both eyes feels disorienting. My left eye was the better one, and I now see more clearly with my right eye, even with a cataract. Dissatisfied with post-op visits — Dr. Friedman kept reassuring me I’d be fine — a year later I transferred to Wilmer’s Bel Air Branch, where an ophthalmologist glibly said: “You have 20/20 vision. There’s been no change.” Then I moved on to Dr. Joe, formerly with Wilmer, and highly recommended by neighbors. He prescribed new drops to bring the pressure down, and added that I may need further surgery in the left eye, with a chance of more loss of vision. As brave as I try to be, I can’t help being frightened. I’ve been practicing closing my left eye now and then. Hope nobody thinks I’m winking. And I’ve given in and gotten hearing aids, had been resisting for some time because of the price. One friend paid $5K and another $10K for a pair. Outrageous! “The New York Times” recently reported that the technology and materials don’t warrant the high cost. But I recently found that my medical plan as a retired New York State librarian covered the $2,800 cost completely — United Healthcare has an agreement with Epic Hearing. So I’ll be wearing them when I watch Downton Abbey again Sunday night at home. At my mellow age, I’m allowed to be sentimental and dispense wisdom, especially on New Year’s Eve, so I’ll pass on some of what I’ve learned over the years. We’re weary of unending wars and the horrors of torture and terrorism. And we have our own troubles and disappointments. But we’ve been given the gift of life with its joys and sorrows — and we’re meant to make the most of it. We only go around once. So laugh, cry, show your love, and vent and argue if you need to — but make up soon. Treasure your loved ones. We’re here to comfort each other in hard times and rejoice together in good times. Mom died suddenly in 1984 at 81 years of age, two days after receiving an encouraging medical report. Her heart was slightly enlarged, and she’d been wearing a heart monitor which showed no incidents. My brother had visited, took her to the doctor appointment, and when they returned to her apartment told her he and his wife were divorcing. I wish Bill had given me a hint — I may have been able to calm mom sooner. She called the following day, asked me to bring Tylenol, and when I let myself in, I was shocked to see her on the sofa, looking pale and weak. “Oh, Eileen, come here,” she said. “I have bad news.” She was still upset that evening, so the next day I left my son with her while I went to work. That night she sounded more cheerful, said she felt much better after the hearty meal I’d cooked for their lunch. But when I came in the morning, she was lying across the bed, as though she’d been sitting on the side and fallen back when God called her. Mom would have been sad to know that my sister, brother and I were estranged for a long while after she died. I’ve agonized over sharing the details, read that memoirs should tell it like it is, but will draw the curtain for now on the family drama that followed. I’ve since heard that sibling disagreements are not uncommon after a death, especially a parent’s — a time when we need each other more. I was heartbroken, cried and prayed often, realized I should keep busy, thought of taking adult ed courses, then had an inspiration — I’d go back to my beloved Queens College and study to be a librarian. The perfect job for an English major who dreamed of being a writer, but learned to type and take shorthand to be employable. (I had a part-time job in an Oceanside school library in the ’70’s, and I fit right in.) As I’ve said, six months after my mother died I was working as a Librarian Trainee in the Rockville Centre Public Library — the building next to her apartment.